Thomas G. Stemberg ’71, founder of the retail chain Staples and a prominent supporter of the Harvard mens’ basketball program, characterized the College’s handling of the Government 1310 cheating scandal as “Orwellian” in a personal letter addressed to University President Drew G. Faust. In the letter, whose greeting read, “Dear Drew,” Stemberg leveled a harsh rebuke at the academic dishonesty investigation that brought down the two co-captains of a Harvard team with NCAA tournament prospects. Harvard announced the massive cheating case at the end of August, and last week a Harvard spokesperson said that the College would make an announcement about the results of the case near the start of the spring semester. In addition to sending his letter to Faust, Stemberg sent copies to Dean of the College Evelynn M. Hammonds, Dean of the Faculty of Arts and Sciences Michael D. Smith, Executive Director of the Harvard Alumni Association John P. Reardon, Jr. ’60, and members of the Harvard Corporation. All declined to comment on this article. Harvard Director of News and Media Relations Kevin Galvin declined to comment on the correspondence on behalf of Faust. Stemberg is listed on gocrimson.com as a co-chair of the Friends of Harvard Basketball, an organization of alumni that fundraises for the team. 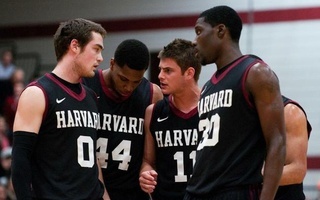 He played a major role in revamping Harvard’s basketball program after former head coach Frank Sullivan was let go in 2007. With other alumni donors, he helped finance a salary increase to recruit current head basketball coach Tommy Amaker, who led the Crimson to its first March Madness appearance in 66 years last season. Star players Kyle D. Casey ’13 and Brandyn T. Curry ’13, who were instrumental in the team’s success last year, were named co-captains of the squad and expected by some to lead the Crimson to a third straight Ivy title this season. But their prospects were derailed by Harvard’s Government 1310 investigation. Media outlets reported in September that both chose to withdraw from the College to minimize NCAA eligibility penalties as they awaited possible disciplinary consequences resulting from the scandal. Stemberg also excoriated the way that assistant government professor Matthew B. Platt organized Government 1310, writing that the structure of the class confused students and contributed to the scope of the scandal. “We had a professor who, like many the Faculty of Arts and Sciences assigns to teach undergraduates, was clearly not qualified to do so,” he wrote. At press time, Platt could not be reached for comment. According to Stemberg, Platt’s inconsistent instructions left many confused about the course’ s collaboration policy. University President Drew G. Faust has been nominated to serve on the Board of Directors of office supply store chain Staples, the company announced this week. Roughly 70 students, or approximately one percent of Harvard’s undergraduate body, were forced to temporarily withdraw from the College last fall in connection with the massive Government 1310 cheating scandal, Harvard indicated in an announcement Friday morning. Stemberg’s letter loses credibility for its lack of proper access to crucial information, making his blanket statements about right and wrong forms of cheating all the more inappropriate.